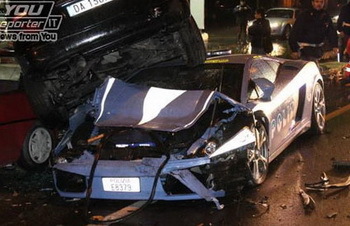 One of the two Lamborghini Gallardo police cars used by the Italian State Police (Polizia di Stato) has dramatically been written off it crashed into a row of parked cars reportedly as it tried to avoid an errant motorist. One of the two Lamborghini Gallardo police cars used by the Italian State Police (Polizia di Stato) has dramatically been written off it crashed into a row of parked cars reportedly as it tried to avoid an errant motorist. According to the slightly injured driver the Gallardo was forced to swerve sharply to avoid a SEAT Ibiza that had exited a petrol station without being aware of the passing police car and the police driver had no option to crash into heavily a line of parked cars. However the Gallardo hit the stationary cars so hard that one of them ended up on the roof of the Lamborghini. The sports car, in blue-and-white State Police colours, with a loud siren and flashing lights on the roof, was donated by Lamborghini to the State Police on the occasion of its 152nd anniversary in May 2004. It hasn't been without controversy as some were concerned that operating the 5.0-litre V10 engined sports car wasn't a positive use of police resources, and it also shed a rear wheel one one occasion. However the Gallardo Police Car has been widely used to promote road safety around Italy and was even shipped to New York on one occasion to take part in the Columbus Day parade. The Gallardo Police Car has been mostly used by the traffic police (Polizia Stradale) during emergencies and alarm situations on the Salerno-Reggio Calabria highway, also under the powers of the special safety operative which is employed along this tract of highway. The Gallardo is used in first aid activities – thanks to its special defibrillator equipment, which performs electrocardiograms and automatic diagnoses of arterial pressure and the presence of oxygen and carbon dioxide in the blood, as well as the transportation of plasma and human organs for transplants. The accident happened near the northern town of Cremona where it had just been displayed at a student fair. One of the police in the Gallardo suffered a broken rib. Apart from being fitted with medical equipment, the vehicle also has advanced technological apparatus’ for receiving and transmitting information and images relating to particularly critical situations, such as road traffic accidents, fires and other disaster situations. All this is made possible thanks to the use of other sophisticated equipment on board the “Lamborghini Polizia”, for example, the satellite navigational system with GSM microtelephone, the Provida system which records violations and sends images in real time, direct connection to the Police database as well as the Elsag “Autodetector” system for number plate recognition and VHF-Polizia equipment. Recently the Italian police were offered the use of Ferrari and Porsche sports cars that were recovered from arrested drug dealers and other gangster figures. However this idea was soon dropped due to the excessive cost to the police budget of maintaining these high performance cars.